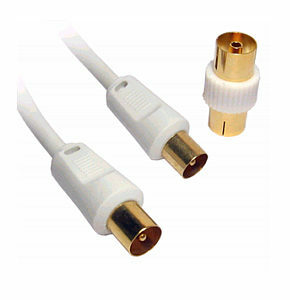 2m Digital TV Aerial Cable. Ideal for Analogue, Freeview and Freeview HD. Satellite TV VHF UHF Combiner Duplexer. 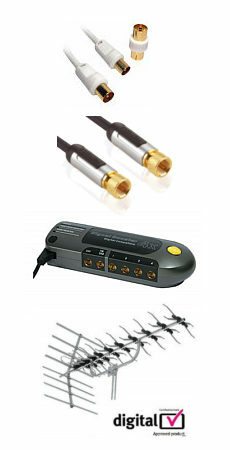 Allows a single coax cable to share satellite and VHF / UHF TV signals. F-type connectors for a secure connection. Power pass on satellite port to power LNB. Metal shell for excellent shielding. Frequency range VHF/UHF: 5 - 860 MHz. Frequency range SAT: 950 - 2250 MHz Units are supplied individually, to share a single coax cable 2 units are required, one each end of the cable. Megaboost Digital TV Aerial for UHF TV with built in signal booster amplifier. Receives all available digital and analogue TV signals. Receives both digital and analogue TV signals. Log periodic design gives consistent performance across full UHF TV band. Built in masthead amplifier with 16dB gain. Suitable for outdoor or loft installation. Supplied with:- Power supply, mounting pole, brackets with fixings and 10m aerial cable. Satellite Finder Kit, Meter Compass case and battery holder for easy satellite dish alignment. Satellite signal strength meter for positioning satellite dishes. Compass for direction alignment. Sat meter with needle pointer with 0-10 scale. Audible indication from meter. Power supply via SAT receiver cable or battery box supplied. (batteries not included) Input sensitivity: 83dB.